Today it is Easter Sunday, which is the fourth day in the Danish Easter vacation. 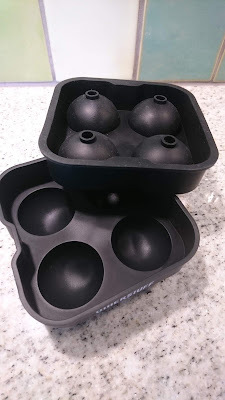 Today it is time to make some Easter eggs in form of a baked cake version using the latest addition equipment in form of a silicone form in egg shape. I have used a Tupperware recipe, which I have got from my cousin with a few flavour modifications in form using lemon zest and liquorice powder as flavouring ingredients. Whip the soft butter and the sugar together into a foamy white mass. Add in the eggs one by one, whip between each addition of egg. Add in the (cake) wheat flour and baking powder. Divide the cake dough into two portions, approx. 200 g per portion. Add lemon zest into one pf the cake dough portions. Melt the chocolate using the micro wave oven. Stir in the melted chocolate and liquorice powder into the second cake dough portion. 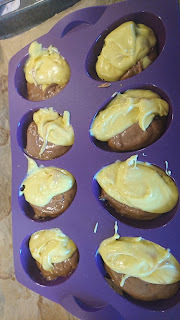 Fill half the egg silicone form with the chocolate cake dough. And fill the remaining part with the lemon cake dough. Bake the cake in fan oven at 180'C for 20 minutes. Cold down the cakes prior to serving them. 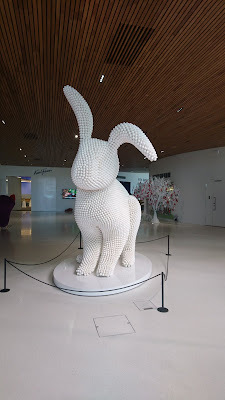 Today it is Good Friday (Langfredag) being the second day of the Danish Easter vacation. 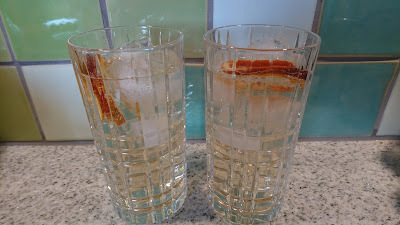 So today, I will enjoy my vacation time with a gin tonic as the third blog post for my Easter Calendar 2019. Start by adding the ice cubes into the large gin bowl. Fill in the gin followed by the tonic. Add in slices of (blood) orange. Today it is Maundy Thursday (Skærtorsdag), which is a public holiday here in Denmark and starting off the Danish Easter vacation with 5 days off from work. 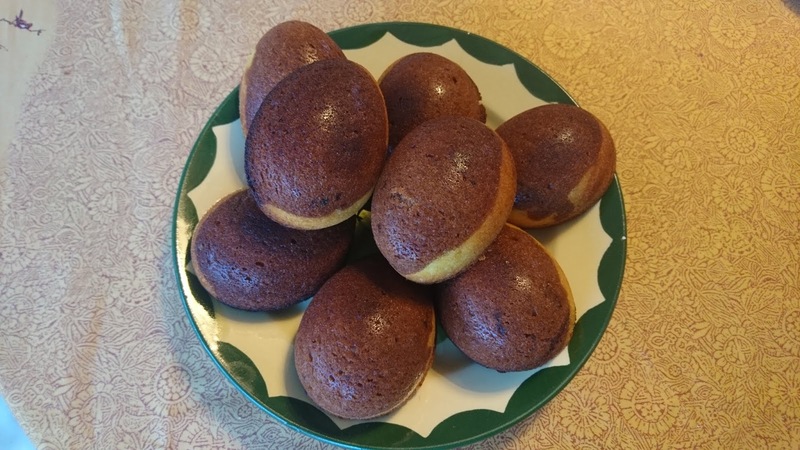 And at the same time it is also the day for the second blog post in my little Easter Calendar 2019 Easter Calendar 2019, where I every Easter day will be sharing a new recipe having a relation to Easter of some kind (according to my definition). I found this recipe on Easter cakes at Dansukker påskeforme, which I decided to bake as the decoration part looks very easy. Sprinkle the surface of the small cakes with icing sugar, place a small fresh flower and the finishing touch of a small Easter candy egg. Add flour, sugar, vanilla sugar, egg yolks, salt, butter and water into blender bowl with a cutting knife. Blend everything together, until the dough comes together. Place the dough in bowl with lid or plastic bag. Let the dough rest cold in the refrigerator for minimum 30 minutes. Meanwhile whip egg whites and salt into firm foam. Add in the sugar, as you keep whipping. Add in the soft butter and whip into a homogeneous mass. Add in the almond and wheat flour and stir into a homogeneous mass. Heat up the oven to 175'C. Divide the pastry dough into 12 pieces. 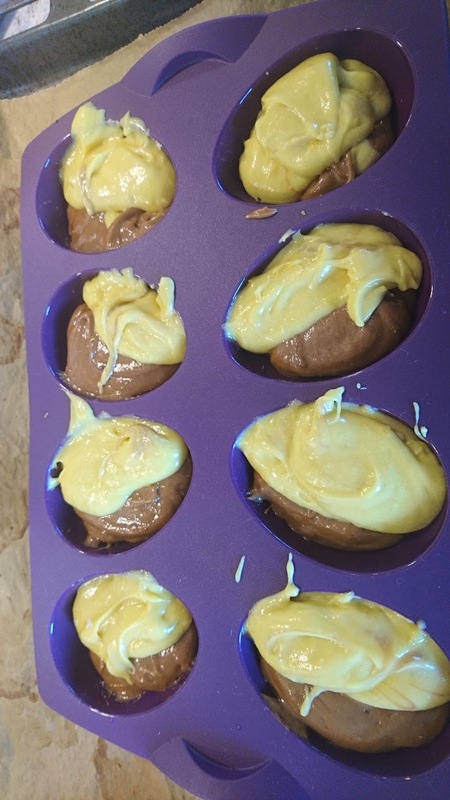 Cover the surface of silicone muffin forms with pastry dough. Fill 1 teaspoon full orange jam into the bottom of the pastry dough. Finally fill the remaining part of the cake form with the cake filling. I use two teaspoon to the add the cake filling on top of the orange jam. Bake the cakes at 175'C for 30 minutes. Remove the cakes from the oven, and let them cool down. 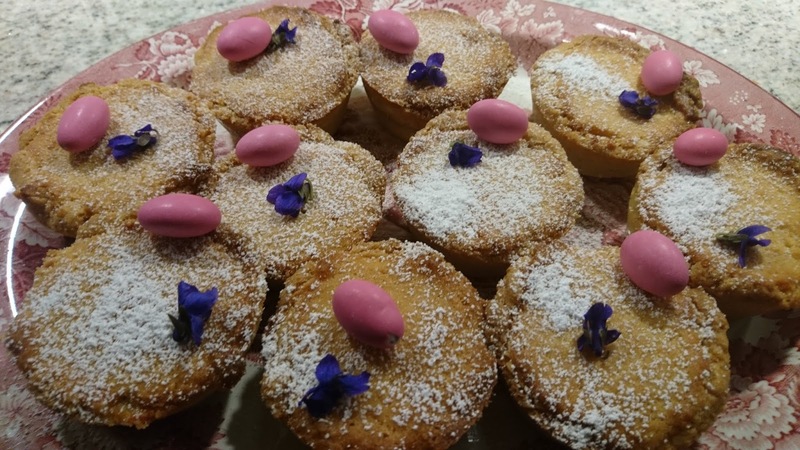 Decorate the surface of the cakes with icing sugar (passed through a sieve), fresh flower and Easter egg candy. Serve together with coffee & tea. Both Christmas and Easter in Denmark involves people meeting up with family and friends in order to spend time together at the annual celebrations. And in Denmark such celebration involves eating dinners or lunches together. For the lunches the aqua vita plays a crucial role as company for the eating of the marinated herrings and the other lunches dishes. 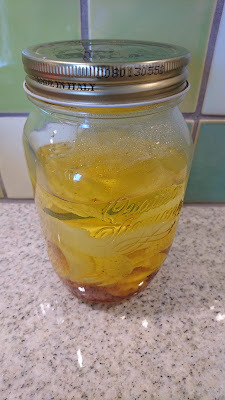 Therefore quiet some people will make various versions of infused aqua vita for lunches either at Christmas & Easter. 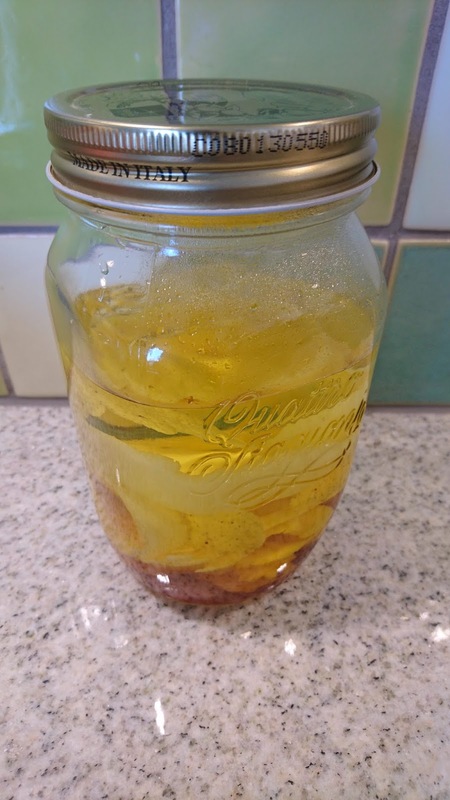 I typical make infused aqua vita for Christmas like this Christmas aqua vita. However, it I think it is the fist time, that I will be making an infused aqua vita for Easter. Well, I think making an Easter aqua vita will be a great thing to make on this Sunday, which is Palm Sunday. I found this recipe on Easter aqua vita in the weekly magazine Søndag (issue 13/2019). I have have no changes to the recipe. The only issue is, that the aqua vita needs a resting time of 2 week after the the four days of infusion !!! Well, I have time enough for the four days if infusion. Wash the surface of the organic lemons. Remove the peel of the lemons with a potato peeler. Only peel the surface and avoid the bitter white of the lemon peel. 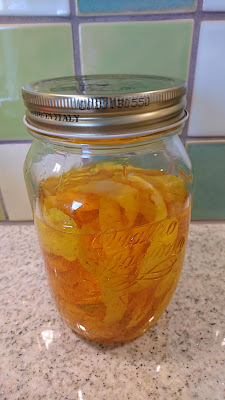 Add the lemon peel together with the saffron to a 1-liter glass. Pour the aqua vita into the glass container. Let the aqua vita infused for four days, shaking the glass from time to time. Filter the aqua vita through a sieve. Pour the aqua vita into a glass bottle. Let the aqua vita rest for 2 weeks, before serving it. 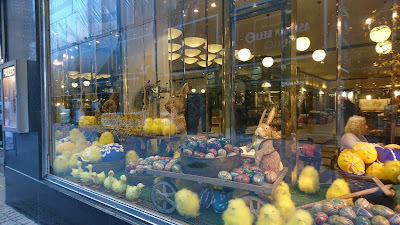 Easter is just about to start. 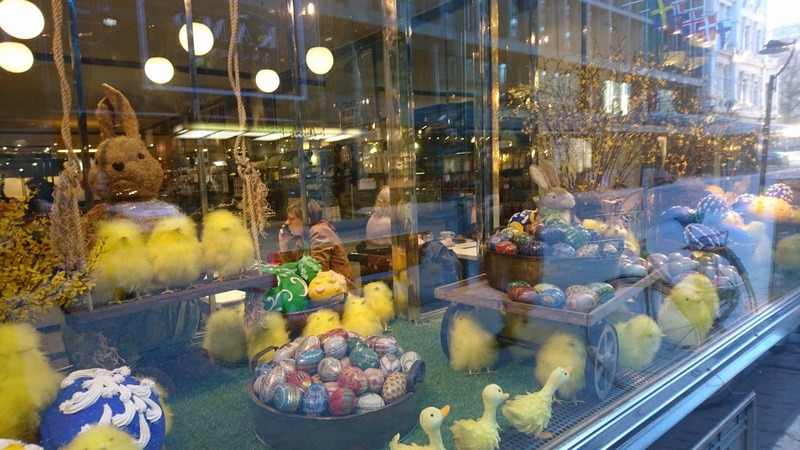 In Denmark we have public Easter holiday in form of 5 Easter days incl. two days in the week-end (Thursday - Monday). The schools are closed the three days just before Easter, so so many Danes will have be on vacation as a family in this upcoming week. 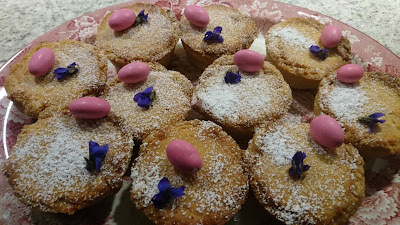 As usual I will be celebrating the Easter with a small Easter calendar, where I will share a recipe from my kitchen on each of the Easter days. I hope you will look from time to time, so I am busy with in my little kitchen. A classic Danish main course is Burning Love (Brændende kærlighed), which is mashed potatoes served with a topping of fried bacon and chopped onions. I recently noticed a recipe in the weekly magazine "Søndag", where the mashed potatoes was mashed root fruits. So for one of the regular Sunday dinners with my mother I served this dish. You can replace the dairy cream with normal full-fat or skimmed milk together with 50 g butter instead of. I would normally used milk, but I had to dairy cream as left-over in the refrigerator. Wash and peel the various root fruits. Cut the root fruit into medium squares to obtain equal boiling time. Place the root fruit pieces in a medium-large cooking pot. Fill in water, so all the root fruit pieces are covered with water. Boil the root fruit pieces in the cooking pot covered with the lid for approx. 20 minutes. While the root fruit are boiling fry the bacon pieces on a hot frying pan. When the bacon pieces are crispy and brown in colour, when add in the chopped onion. Let the onion until, they are clear in colour. Afterwards add in the chopped carrots. Keep the bacon topping warm on the frying pan, until serving the dish. When the root fruit pieces are soft, empty the cooking pot for water. Mash the root fruit pieces into a rough puree. Add the dairy cream into the root fruit puree. Stir well. Add in the butter, and let it melt. Season the mashed root fruit with salt and pepper. 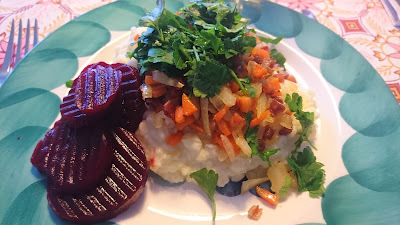 Serve the mashed root fruit with bacon topping, pickled red beets and decorate with chopped parsley. I found a new ice cube form last time I visited Trapholt in their shop. The shape is a smaller version of ball shape compared to the last brought ice cubes form size xxl. 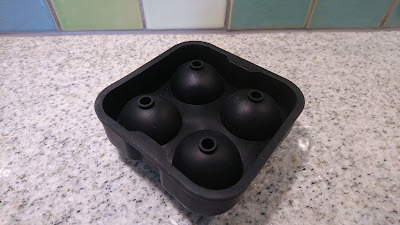 So now I can make various sizes of ice cubes in ball shape. Let's see, what kind of funny stuff I will make using this new ice cube form besides from ice cubes ?